Vodacom will take occupancy of a brand new 17 000m2 warehouse at Louwlardia on 1 November, which it will use as a central storage facility for the equipment used to support and maintain its mobile network. The state-of-the art warehouse has a 15m eaves height and an ultra-flat FM2 floor, which provides the ideal platform for smooth and efficient movement of mechanised logistics machinery as well as Vodacom’s substantial racking needs. Fortress purchased the 16.8ha Louwlardia site, situated on the corner of Olievenhoutbosch road and Nellmapius drive, in 2015 and has since developed three large warehouses while still retaining space for a possible fourth development. 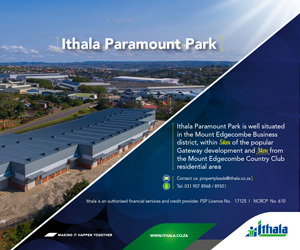 These include a 33 000m2 warehouse facility (currently used by Goldwagen); a 23 600m2 facility with We Buy Cars as a tenant; and the soon-to-be completed warehouse to be occupied by Vodacom. Prinsloo says the site still has enough vacant land to comfortably accommodate another 14 000m2 facility should Fortress decide to proceed with additional warehouse development. Fortress is currently developing six new logistics properties and one retail facility with a combined total gross lettable area (GLA) in excess of 154 000m2 at a cost of R1.5 billion. This forms part of a deliberate strategy to expand its logistics-focussed asset base to approximately two thirds of its total portfolio by 2020, a rebalancing process designed to capitalise on where it sees greater growth opportunities in the foreseeable future. The Johannesburg-based REIT currently owns 100 logistics-focussed properties, comprising about 42% of its total portfolio. The remainder includes retail (35%), industrial (13%) and office (10%) properties. Its post-2020 ambition is to have an overall portfolio mix comprising two-thirds logistics and one-third commuter-focussed, rural retail properties.